President Barack Obama announced over the weekend a new energy plan called "Power Africa." The plan will invest $7 billion in U.S. taxpayer money to bring electricity to sub-Saharan Africa and will generate huge rewards for General Electric, a company run by former Obama economic adviser Jeffrey Immelt, Forbes reports. General Electric will be perhaps the biggest beneficiary of that $7 billion in U.S. taxpayer funds that Obama says will underwrite Power Africa. The lion’s share of the $7 billion appears to be directed by the U.S. Export-Import Bank, which will "make available $5 billion in support of U.S. exports for the development of power projects." This doesn’t mean that Ex-Im is spending or investing those $5 billions, rather the job of the Ex-Im bank is to help finance trading opportunities that private sector lenders are not willing to take a risk on. As Ex-Im describes its mission: "We assume credit and country risks that the private sector is unable or unwilling to accept. We also help to level the playing field for U.S. exporters by matching the financing that other governments provide to their exporters." G.E. 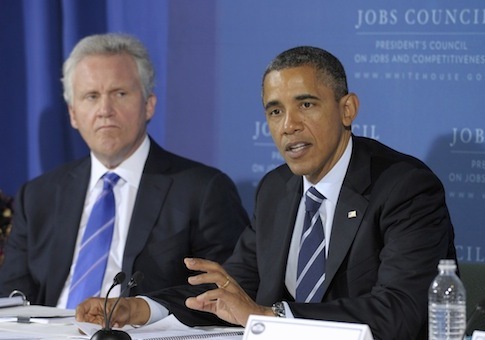 CEO Jeffrey Immelt, who until early this year chaired the president’s Council on Jobs and Effectiveness, will clearly appreciate a financial backstop from Uncle Sam. Federal guarantees will reduce G.E. financial risks in Africa and will help it compete better against Chinese companies, which have been falling over themselves to invest in Africa. U.S. exports to Africa have been growing, having reached $21 billion in 2011, up 23% from 2010. The U.S. imports some $60 billion a year from sub-Saharan Africa — though most of that is crude oil. This entry was posted in National Security and tagged Africa, Cronyism, General Electric. Bookmark the permalink.